Fitdog recently attended a private screening of Superhero Dogs, part of California Science Center‘s current exhibition, Dogs! A Science Tail. Safe to say, it was awesome, and we’re here to tell you all about it. Dogs! 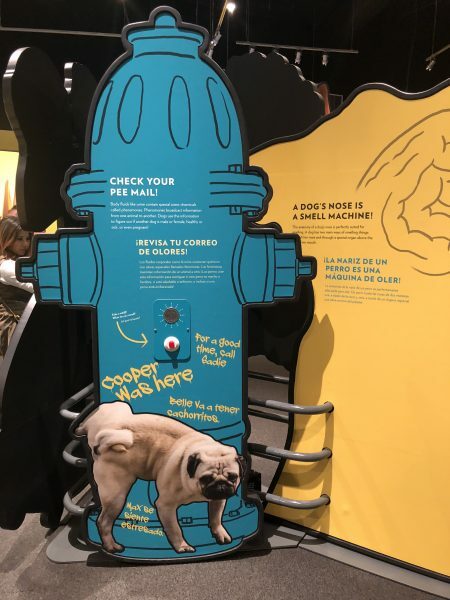 A Science Tail features fun and interactive exhibits that take visitors on a journey of what makes dogs so special. Test your running speed with a timed meter, or your pop culture knowledge by playing a game of Jeopawdy. Art lovers can appreciate original works by Norman Rockwell and Charles Schulz, all featuring our four-legged companions. Plus, there’s plenty to learn about how dogs interact with the world, and the incredible science behind their anatomy. At Fitdog, we already knew dogs are superheroes. But this exhibition will make everyone believe in the superpowers of our everyday heroes and best friends. One of the highlights of the Dogs! A Science Tail is the 3D IMAX movie, Superhero Dogs presented by Mars Petcare, narrated by none other than Captain America himself, Chris Evans. This film follows the incredible journey of Halo, a Dutch Shepherd, on her way to becoming a certified Search and Rescue Dog for Miami Task Force One. The story closely follows Halo through extensive training until she takes her final certification test. But whether or not she passes, you’ll just have to see for yourself! Along the way, we meet many other Superhero Dogs from around the world. Henry, for instance, works on the ski slopes of Whistler, Canada to help find people lost in avalanches. We also meet Reef, a Newfoundland from Italy who rescues people in oceans and lakes. Then there’s Tony and Tipper, bloodhound brothers who work on a wildlife reserve in Kenya to sniff out poachers and keep endangered animals safe. And finally, we meet Ricochet, a surfing dog from Southern California whose superpower is her receptive energy (and her ability to ride a wave). This exhibit is open until January 2020, and you can find information on ticket pricing here. The IMAX movie costs extra. If you live close to the Metro, the Expo Line will drop you off right in front of the museum (and save you money and time on parking). In addition to Dogs! A Science Tail, California Science Center has a lot of cool stuff going on. You can see actual spaceships, ride a bicycle across a high-wire, or learn about different ecosystems. The museum is located in Expo Park, which also includes a lovely rose garden and many other museums in the same vicinity. One can easily make an entire day out of this exhibit and its surroundings, so what are you waiting for? Shake a tail feather and get yourself over to the California Science Center to see Dogs! A Science Tail.